Choreographers will premier seven new dances during the appropriately named “First” Dance Spectrum concert Wednesday through Saturday (Dec. 1-4). The first Dance Spectrum to be presented in the Performing Arts Center Dance Theater will be at 8 p.m. each evening, with a 2 p.m. Saturday matinee. The concert will feature choreography by the internationally acclaimed SHSU dance faculty and guest artists Erin Reck and Mickie Koster. Reck will premiere “National Disaster #5,” in which she integrates 11 dancers into music by Octopus Project and Gustavo Santaolalia. “[T]his piece is inspired by the human ability to persevere and mobilize with strength and compassion through extreme disasters, from global to personal,” Reck said. “We use metaphors of strength juxtaposed with others of fragility to portray the complex and dichotomous nature of life and human behavior. “Wolosodon: The Spirit of Freedom,” by Koster, is a traditional dance from Mali, influenced by the Wolloso people of West Africa, that portrays a woman’s spiritual journey to freedom. During the performance, master drummer Baba Soury Abubabkr will play live while a dozen dancers fill the stage. Costumes by Rebecca Cobo enhance the dazzling piece perfectly, according to Cindy Gratz, SHSU dance professor. SHSU assistant professor of dance Andy Noble will premiere “Maelstrom,” a work for a dozen men, which comments on male behavior in modern day society. "It really is a reflection of how some men swallow their emotions in an effort to fit societal norms,” Noble said. 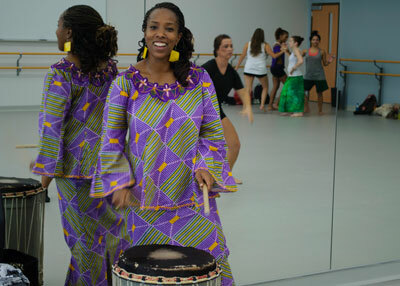 “I drew inspiration from movies such as ‘Fight Club’ and ‘Where the Wild Things Are.’"
Dionne Sparkman Noble, SHSU dance lecturer, will present “Popsicle,” a “lighthearted and playful dance capturing the feeling of long summer days and a time free of excess responsibility,” according to Noble. "I wanted to create a dance that wasn't a dance,” she said. “One that would highlight everyday gestures in a way that was virtuosic while at the same time remaining somehow outside of traditional dance vocabulary. “When I found the quirky and jubilant collection of music by Paul Mottram and Chris Blackwell, I was off and running." SHSU dance coordinator Jennifer Pontius will premiere “Cerulean Sea Creatures, a “fanciful, modern ballet exploring images of aquatic beings, both real and legendary,” she said. “The delicate piano melodies of Philippe Reverdy provide the soundscape in which five dancers clad in hues of blue and green tendril-dripping unitards, morph from skates, to crabs, to mermaids, a school of fish, a silly sea serpent, seaweed, or whatever other ocean organisms the viewer may imagine,” Pontius said. It is a comic theatrical dance inspired by Charles’ observations of hobos “hanging out on a deserted street corner, listening to music, drinking and dancing, having a good old time,” he said. He encountered these homeless men and women living around the deserted buildings and overgrown parking lots on a recent trip to the Barnevelder Theatre in downtown Houston. “It was a real eye opener to their plight and way of life,” he said. Tickets are $15 for general admission and $12 for students and senior citizens. They can be purchased at the PAC Box Office at 936.294.2339.